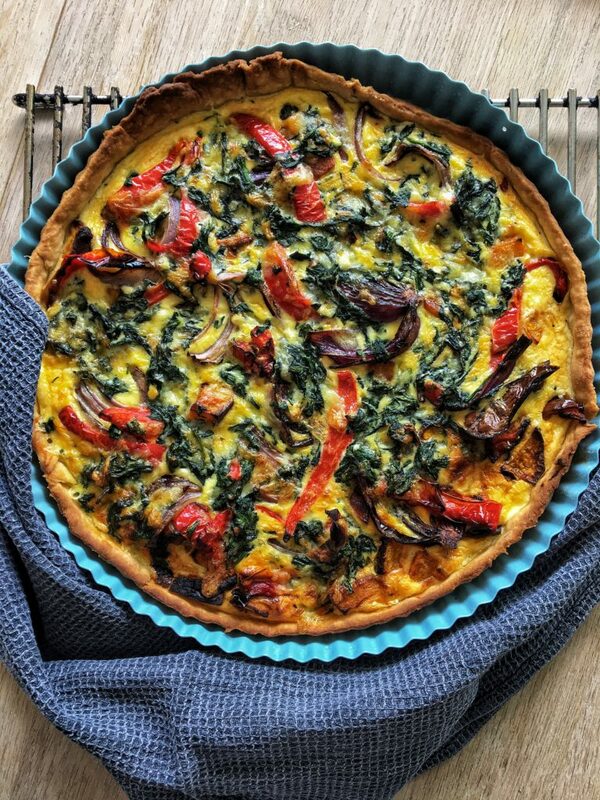 ﻿ Roasted Vegetable Quiche - I AM Co. This roasted vegetable quiche came out of a desire to use up all of our fresh produce. We’ve mentioned it one hundred times but we just HATE to see good nutritious food go to waste! This recipe is also known as your new throw-all-your-leftovers-into-a-one-dish meal. Truly, it can’t get any simpler. This is the no-frills, adapt-as-you-wish type of dish that you can enjoy as breakfast, lunch, or dinner. Pre heat the oven to 180 deg Celsius, Fan-bake. Grease your tin & roll the pastry to fit, approximately 3mm thick. Line the pastry with baking paper and blind bake for 15min or until golden. Remove from the oven & allow to cool. Increase the oven temperature to 200 deg. Place the pumpkin, capsicum, red onions and mushrooms into a baking dish and toss in the olive oil, salt & pepper until well coated. Roast in the oven until browned and caramelised – approx. 20min. Reduce oven temperature again to 180 deg. Blanch or steam the spinach briefly and allow to drain in a colander until cool. Beat the eggs, cream, milk, half the cheese and salt until well combined. Once the spinach is cool enough to handle squeeze as much moisture out as possible. Roll up and roughly chop then add it to the liquid mixture. Mix again. Remove the baking baking from the tart pastry. Sprinkle remaining cheese on the bottom, spread the roast vegetables around, distributing evenly and then pour the egg mixture over the top. Bake in the oven for 15-20min or until set. Enjoy warm with some fresh greens on the side.